Factual error: In the scene where Roxie is placed in the "paddy wagon" to be taken to Cook County Jail, the prosecutor refers to himself as District Attorney Harrison. However, the court system in Illinois doesn't have district attorneys; rather, they have state's attorneys. The original play by Maureen Watkins correctly calls him a state's attorney. 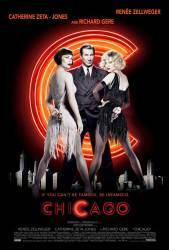 Trivia: Renée Zellweger, Catherine Zeta-Jones, and Richard Gere all did their own dancing and singing. Trivia: In 'Cell Block Tango', the scarves represent murder. While the other four murderesses carry only one red scarf, Velma carries two (one for her husband and one for her sister) and Catalina has one white scarf to show that she alone is innocent. Trivia: Hunyák's story in the cell block tango (translated from Hungarian) is "What am I doing here? They say my famous lover held down my husband while I chopped off his head. But it isn't true, I am innocent. I don't know why Uncle Sam says I did it. I tried to explain it at the police station but they did not understand me."